Process work is tricky enough, but now professionals must address disruptions and opportunities caused by technologies—predictive analytics, process automation, and AI. To further complicate things we must also find a balance between using analytics to drive organizational improvements with the need to incorporate human elements in problem identification, solution development, and implementation. This year’s conference theme was kicked off by APQC’s John Tesmer, director of Open Standards Benchmarking®, with a conversation on process management’s challenges—in the words of the conference participants—and stage setting on shifts in our work caused by the early adopters of AI, machine learning, and robotic process automation coming for all of us. 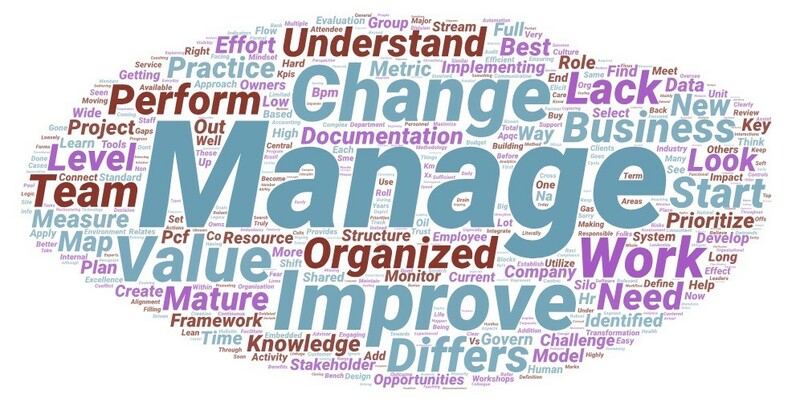 In the weeks leading up to the conference APQC reached out to conference registrants and speakers alike and identified their top challenges, which APQC converted the responses into a wordle. Improving how we improve through technology and human-centric design. Though these three themes seem disconnected at first, they parallel sentiments found earlier this year in our annual priorities survey. That though process work is on the brink of a much-needed change, there are great opportunities for organizations that get these three challenges right to provide strategic value through organizations’ digital and customer-focused initiatives. Speakers throughout the conference built on these themes of digital or technology savvy and human engagement—to deliver organizational value. Eric Siegel, founder of Predictive Analytics World, author, and speaker; introduced conference participants to the foundation of technical competencies—namely the marriage of analytics with technology—predictive analytics. “The bottom line is, you don’t have to predict accurately. Predicting is better than guessing—which this technology does—and is generally sufficient to drive value by rendering mass-scale operations more effective,” said Siegel. Adeeb Barqawi, founder of ProUnitas, also explored the connection between digital expertise and process improvement. Barqawi outlined his personal journey and the development of a platform that helps schools identify at-risk students, connect them with resources, and track their progress to ensure they receive the care they need to achieve success in and beyond the classroom. Roy Barnes, author and consultant, explored the human components, namely the need to deliberately engineer the internal customer experience in our process work. As Barnes explained, “the only sustainable competitive advantage we have moving forward is the relationship you have with your internal and external customers.” Jamie Capehart, manager of organizational development at the Goodway Group, brought the theme of human engagement around to our role in developing our teams’ unique skills and strengths. Capehart discussed her own pilgrimage for identity and how her experiences with mentorship and a strengths-based approach to building teams changed her life and resulted in recognition by the Malcolm Baldrige National Quality Award committee for her process improvement teams’ client focus and ability to carry the organization forward into the future. Finally, APQC’s John Tesmer and Jeff Varney, joined me in the closing session to tie the themes together to discuss the three key skillsets process professionals need moving forward—technical literacy, exemplary change management skills, and human-centric design. With over 200 people gathered to share ideas and problem solve, this year’s conference was a nexus of best practices and lessons learned from organizations focused on excellence and continuous improvement. The topics addressed in the sessions and ensuing conversations ranged from the building blocks of developing frameworks and business rules to identifying skillsets for the digital workspace. To learn more about these sessions and conversations at the conference and the experiences shared, check out the presentation slides and written overviews from the sessions. The overviews, which summarize key points and takeaways from each speaker, are available to nonmembers for a limited time. And if you don’t want to miss out on next year’s event, you can already register for the 2019 Process and Performance Management Conference.